The new premises of the Chaseside Convalescent Hospital, at the corner of Beach Road and St. George's Square, were formally opened on Saturday afternoon by the Lord Mayor of Manchester (Ald. Thomas Smethurst, J.P.). The new premises are in every respect admirably adapted for the purpose, and the house has been placed at the disposal of the committee by Mr. Porritt. Large lofty rooms have been excellently equipped and divided into wards. The hospital overlooks the Ashton Gardens, and the bright, sunny aspect and cheerful outlook will add to the value of the institution. There is accommodation for 30 soldiers, and arrangements can be made to extend the accommodation to 35. There is an excellent staff of nurses under the control of an experienced matron. The hospital is managed by a large committee representative of the town, and is joined up with the East Lancashire branch of the Red Cross Society. The Vicar (Rev. H. E. Butler) is chairman of the committee, with Mr. J. Thomas as hon. secretary, and Mr. J. E. Kin as hon. treasurer. The committee have already received substantial support, and the very mention of the Hospital will commend it to St. Annes residents and ensure for it the support which St. Annes has always given to a good cause. Many beds have been endowed, and the Old Links Golf Club have undertaken the support of five. There was a large attendance at the opening ceremony. The Vicar presided, and in addition to the Lord and Lady Mayoress of Manchester there were also present Coun. R. Leigh (Chairman of St. Annes Council), Coun. C. F. Critchley, C.C., J.P., Coun. J. H. Taylor, Rev. A. E. Howe, Dr. Elliott, Messrs. J. Thomas, J. E. Ting, S. L. Stott, J.P., G. W. Parkes, R. S. Boddington, C. Craston, H. Mather, C. A. Stead, J. A. Brown, Dr. Hart (county director of the Red Cross Society), and a large number of ladies. The Vicar said that he had just come from another meeting in connection with the University Extension Lectures, where it was decided that as they were keeping the tercentenary of Shakespeare, they should endeavour to secure a lecturer who could bring prominently forward the subject of patriotism. Patriotism was a very beautiful word, and they had heard a great deal about it, but it was not a very easy word to define. It seemed to him that it might be defined after this fashion: that it behoved everyone to look about and see what the needs of his country were, and when he had discovered those needs, in whatever direction they lay, to endeavour to supply them. It seemed to him that it was in the spirit of patriotism that the Chaseside Hospital was first brought into existence. They had to carry their minds back to what he might almost call the dark days of 1914, when the Belgian population were pouring into this country in great numbers and it was quite evident that the country looked for the inhabitants to supply shelter and hospitality. They in St. Annes took up that question in many ways and offered hospitality and shelter to the Belgian refugees. 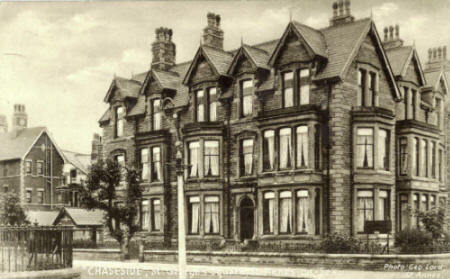 Chaseside Hospital was organised for that purpose, but before they got Belgian refugees into the house, the order came that no more refugees had to be admitted into this district. Consequently they looked in another direction and had Belgian soldiers to occupy the house, which was situated in Headroomgate Road. (Applause.) That was an excellent lead for those who wished to support the hospital. The committee had been considerably enlarged and was something like 20 in number. Their idea was that they should not only enlarge the usefulness of the hospital, but that they should enlist the sympathy of all creeds and people in the town, and that they should have on the committee various shades of thought. From what he knew of the committee they were all likely to work very harmoniously together and have one object in view--the welfare of the soldiers who came under their care and protection. The hospital had six wards, and each ward provided accommodation for five soldiers, so that at the present moment they were able to accommodate something like 30 soldiers. and the good-feeling of the people of St. Annes to come forward and give that support which would make their hospital the very best in the country. They wanted it to be so and they relied upon the people of St. Annes doing what they could to make that effort crowned with success. On behalf of the committee he extended a very cordial welcome to the Lord Mayor of Manchester. He did not think they could have any one more suitable to do that little act of service. (Hear, hear.) He was well-known in St. Annes, having resided here for several years. St. Annes was sometimes called Manchester-by-the-Sea in consequence of the great number of residents of St. Annes who had their work in Manchester. He had also heard St. Annes called the dormitory or sleeping-house of Manchester. (Laughter.) Whether it was the sleeping-house of Manchester he did not know, but he was certain that the gentlemen who went to Manchester when they returned to St. Annes did not pass all their time in sleeping. They were very active and were always ready to do their share in supporting anything which was worthy of their help. St. Annes was one of the most enterprising little places they could find in the country at the present time. They had only to think of the beautiful way in which the Gardens opposite had been laid out, and of the magnificent open-air swimming bath which had lately been formed to see that St. Annes had in mind in making them an effort to be second to none as a watering place. If that was their intention with regard to the town itself he was quite certain that they would not wish to be behind in doing all they could to support and make prosperous that hospital. They welcomed 21 soldiers who had already gallantly done their duty, and wished to show them how much their efforts were appreciated by giving them a real comfortable time here with such entertainment and hospitality that they might be completely returned to health again. (Applause). The Lord Mayor said he was afraid that his wife and himself had been a little too prominent in St. Annes lately. (No, no!) When the Vicar asked him a few weeks ago if he would take part in opening that hospital he felt some hesitation about it because he thought it would be more proper that Mr. Leigh, chairman of the Council, should do it. He was assured, however that Mr. Leigh wished him to do it, and he felt he could not further refuse, as be certainly did not wish to appear in the least degree discourteous to his friends in St. Annes. That hospital was directly in connection with 'Manchester. He had had an opportunity of inspecting the hospital and the arrangements, and, as anticipated, he found they were admirable. The Lady Mayoress and himself had had occasion to visit a number of military and Red-Cross hospitals in Manchester and district, and his wife happened to be chairman of the committee of the Red Cross hospital at Worsley Old Hall, which had 132 beds. in the town, and there should not be the slightest difficulty in providing necessary funds and of obtaining a reputation for that convalescent hospital of being second to none in the country. Personally, he was anxious for the reputation of St. Annes. He lived here and he wanted St. Annes to keep its end up in every way. St. Annes was the only sea-side convalescent hospital identified with the East Lancashire branch of the Red Cross Society. The number of beds in the East Lancashire hospitals numbered 3,000. In addition to the military hospitals, which made, their own arrangements for convalescent soldiers, up to March 3rd, 1916, these hospitals had received no fewer than 37,000 wounded soldiers, all of whom were removed from the stations to the base hospitals by the voluntary transport section of the Red Cross Society. The number of ambulance trains which arrived in Manchester to that date was 223, and he was glad to say that the number of voluntary aid detachments in East Lancashire exceeded those of any other county. He ought, perhaps, to remind them how the term "Red Cross" originated; as a matter of fact it was adopted by the Geneva Convention, in 1864, when representatives of the various European countries met together, and the Red Cross was voted as the international symbol of medical service in war. He would like to say a word of encouragement and appreciation of the services which had been rendered and which would be rendered by those young ladies in St. Annes who were acting as nurses and devoting themselves to that work, which could not he called child's play. It meant self-sacrifice and hard work, but he was a young lady he should consider it a very great honour to be a Red Cross nurse. He ventured to say that in the years to come they would look back with very much pride and pleasure to what they were now doing, and be thankful they took part in that noble work. He hoped the war would soon be ended, and that the doctors and nurses might be relieved of their labour of love. He had much pleasure in declaring the Hospital open. The Lord Mayor and Lady Mayoress then led the way inside, three hearty cheers being given .at the call of the Vicar. Up to date no fewer than 15,409 eases had passed through their Red Cross hospitals in East Lancashire since the outbreak of the war. In addition to the Red Cross transport section was the official transport for the Lord Derby war, hospital at Winwick, and the Second General Hospital, Manchester. That work was carried on by voluntary workers and had not cost the country a half-penny and he hoped never would. They had transported 113,428 cases and in addition they dealt with all the stores and supplies to those hospitals. They had, besides a very active comfort section which, in addition to supplying hospitals in East Lancashire, had sent out over 500,000 articles to the fighting areas. They had also a department for enquiries after wounded, missing, and so on. They would therefore understand how important it was that the chief magistrate should give his support and cordial co-operation. With regard to Red Cross work there was one point he wished to bring home—the Red Cross Society was a band of laymen opposed to militarism, banded together to do all they could in this national crisis to help the military parties in the tremendous task that lay before them. If he had his way he would take one line of Shakespeare. 'For he to-day that sheds his blood with me shall be my brother," and alter one word to make it read, "For he to-day that sheds his blood for me shall be my brother." There was no excuse for anyone who said they could not help. Societies such as the Red Cross gave everyone an opportunity of rendering sensible and useful help. Through the comforts section they could send the right thing to the right place at the right time, not sending a pair of socks to a man who wanted an overcoat and that kind of thing. There was no excuse for anyone standing aside and saying it did not concern them. There was no excuse for the man who stood aside and said, "While the country is at war I am going to make money." There was no excuse for anyone grumbling. The only man who had a right to grumble was the man in the trenches. When they thought of what those men had gone through, and would go through, they would agree with him that it was up to everyone who stayed at home to do what they could. No thinking of personal advancement or financial gain; the men who had gone to the front had given their all. No banking account was of any value to a dead man, therefore they ought to do everything they possibly could. The vote was heartily accorded. The hospital was afterwards inspected by most of those present.